The 5 way manifold is moulded from durable polypropylene with 5 x 1” female BSP outlets, ideal for building unique water fountains and features. 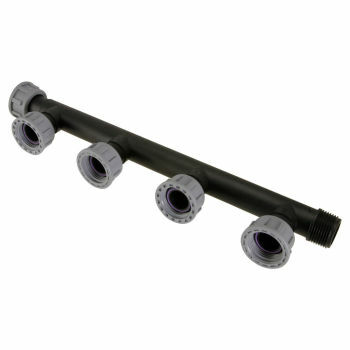 Can be used to connect pumps to water features without the need for many individual fittings. The 5 way manifold can be used together with our range of Single Jet fountain Nozzles and Foaming Jet Nozzles to create stunning water jet displays in ponds or stand-alone water features.